Note for all! 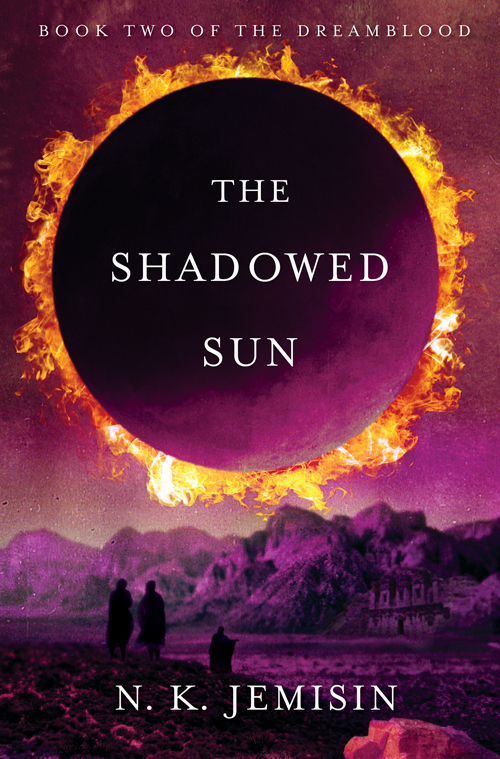 This will be the only sample chapter of The Shadowed Sun I’ll post, because subsequent chapters contain spoilers for The Killing Moon. Sorry! There were two hundred and fifty-six places where a man could hide within his own flesh. The soldier dying beneath Hanani’s hands had fled to someplace deep. She had searched his heart and brain and gut, though the soul visited those organs less often than layfolk thought. She had examined his mouth and eyes, the latter with special care. At last, behind a lobe of his liver, she found his soul’s trail and followed it into a dream of shadowed ruins. Piles of rubble loomed out of the twilit mists—crumbling structures so titanic that each single brick would dwarf a man, so foreign in design that she could not fathom their purpose. A palace? A temple? Camouflage, regardless. Beneath her feet the dust gleamed, something more than mica: each step displaced a million stars. She took care to put them all back in her wake. To find the soldier, Hanani would have to first deal with the setting. It was simple enough to will the ruins into order, which she did by crouching to touch the ground. Threads of dreamichor, yellow-bright and gleaming, laced from her fingertips and etched the ground for a moment before vanishing into it. A breath later, the dust skittered up to seal cracked stone; the harbinger of change. Then the earth split and the ground shook as great bricks righted themselves and flew through the air, clattering together to form columns and walls. All around her, had she chosen to watch, the outlines of a monstrous city took shape against the gradient sky. But when the city was whole, she rose and moved on without looking. There was far more important work to be done. After first passing a stone archway, Hanani paused and turned back to examine it. The arch was man-height, the only thing of normal proportions in the dreamscape. Beyond the arch lay the same shadows that shrouded all — no. The shadows were thicker here. Prowling carefully closer, Hanani attempted to step through the archway. After a moment’s consideration, she summoned pain and fear and rage instead, and wrapped these around herself. The shadows’ resistance melted; the soldier’s soul recognized kindred. Passing through the arch, Hanani found herself in an atrium garden, the kind that should have helped to cool the heart of any home — but this one was dead. She looked around, ducking splintered palms and wilted moontear vines, frowning at a suppurating mess of a flowerbed. Then she spied something beyond it: there at the garden’s heart, curled in a nest of his own sorrow, lay the soldier. Pausing here, Hanani shifted a fraction of her attention back to the waking realm. That done, Hanani returned to the dream of the hidden garden. The soldier lay with knees drawn up and arms wrapped about himself as if for comfort. In the curve of his body, a gaping wound spilled his intestines into a hole at the nest’s heart. She could see nothing beyond the hole, only that perverse umbilical connecting him to it. Death, said the air around him. He did not move, hungering again for death. Again she demurred. Memory, she offered, to entice him. Anguish flared up in cold, purple-white wisps, wreathing the area around the nest as a new form coalesced. Another man: older, bearded in the way of those who bore northern blood, also garbed as a soldier but clearly of some higher rank than Hanani’s soldier. A relative? Mentor? Lover? Beloved, whoever he was. “May he dwell in Her peace forever,” she said. Extending her hands to either side, she trailed her fingers through the ring of mist. Where she touched, delicate deep red threads blended and pulsed into the white. Hanani’s soldier moaned and curled into a tighter ball as red threads stretched forth from the walls, soaking into his skin. Abruptly the mists flickered, the bearded soldier’s image growing insubstantial as shadows. New scenes formed instead, appearing and overlapping and fading with each breath. A lonely perch atop a wall. Sword practice. A barracks bed. A river barge. No. She formed her soulname’s syllables within her mind and clarity washed through her, a reminder that this was a dream and she was its master. This pain is not my own. When she drew her hand back, it was whole. But the man was not; the pain was devouring him. She focused on the images again, noting one of a tavern. The petitioner was not there, although his dead beloved and other comrades were, laughing and singing a lusty song. There was danger in this, she realized abruptly. The petitioner had been injured in a raid, his beloved killed. She had no idea whether the rest of his companions had been cut down as well. If so, then what she meant to attempt might only increase his death-hunger. There was no choice but to try. Distractions could be dangerous, even deadly, in narcomancy. Focusing her mind on the task at hand, Hanani reshaped the tavern scene around her soldier. His comrades stopped singing and turned to him, offering greetings and reminiscences and sloshing cups. The beer shone a warm deep red in the dreamlight. Behind them, Hanani quietly faded the bearded soldier away. The man groaned, uncurling from his nest and straining up toward his comrades. A great wind soughed through the dreamscape, blowing away the city and the shadows. Hanani exerted her will in concert with the man’s and the garden swirled away, its shadows suddenly replaced by bright lanterns and tavern walls. The nest lingered, though, for the man was bound fast to his pain. So instead Hanani touched the edge of the nest and caused it to compress, shrinking rapidly into a tiny dark marble small enough to sit in his palm. He gazed mournfully at Hanani and clutched the marble tightly to his breast, but did not protest when Hanani caused the rope of intestine to fall free, severing his linkage. She pressed the dangling end against his belly and it vanished, as did the wound itself. Lastly she summoned clothing, which blurred for a moment before his mind shaped it into the gray-agate collar and loinskirt of a Gujaareen city guard. The soldier nodded to her once, then turned to join his companions. They surrounded him, embraced him, and all at once he began to weep. But he was safe from danger now — and she had made him so, made him whole again, body and soul alike. I’m a Sharer now! But no, that was presumption. Whether she’d passed the trial to become a full member of the Sharer path was a matter for her pathbrothers to decide, and the Council to confirm, no matter how well she’d done. And it was utter folly to let her emotions slip control while she remained in dreaming; she would not ruin herself by making a child’s mistake. So with a deep sigh to focus her thoughts, Hanani released the soldier’s dream and followed the faint red tendril that would lead her soul back to its own housing of flesh — But something jolted her awareness. She paused, frowning. The dreamworld of Ina-Karekh lay behind her, inasmuch as such things had any direction at all. Hona-Karekh, the waking realm, was ahead. She opened the eyes of her dreamform to find that she stood in a gray-shadowed version of the waking realm, where the tension and busy movement that had filled the Hall of Blessings a few moments before were suddenly still. She stood on the dais at the feet of the great, looming nightstone statue of Hananja, but her petitioner was gone. Mni-inh and Teacher Yehamwy, who had come to oversee her trial, were gone. The Hall was silent and empty, but for her. The realm between waking and dreams. Hanani frowned. She had not intended to stop here. Concentrating, she sought her soul’s umblikeh again to complete the journey back to waking — and then stopped, hearing something. There. Over near the tithing alcoves, where Sharer-Apprentices and acolytes drew dreams from the minds of sleeping faithful. A slow, deep sound, like nothing she’d ever heard before. Grinding stone? Or the breathing of some huge, heavy beast. Nothing in the between realm was real. The space between dreams was emptiness, where the soul might drift with nothing to latch onto — no imagery, no sensation, no conceptualization. An easy place in which to go mad. With her soulname and training, Hanani was safer, for she had long ago learned to build a protective construct around herself — the shadow-Hall in this case — whenever she traveled here. Still, she avoided the space between if she could help it, for only Gatherers could navigate it with ease. It was troubling to say the least that she had manifested here unwittingly. Squinting toward the alcoves, she wondered: had she forgotten some step in healing the soldier, done something wrong in the transit from Ina-Karekh? A man’s life was involved; it was her duty to be thorough. The shadow-Hall shivered all over, then turned bright and busy with people and breezes and murmurs. Hanani caught her breath, blinking as her soul settled back into her own flesh. The waking realm. Her mentor stood beside her, a troubled look on his face. “You’ve done enough, Apprentice,” said a cold voice. Yehamwy, a heavyset, balding Teacher in his early elder years, stood glowering beside the healing area. Before her, on one of the wooden couches set up for Sharer audiences, Hanani’s soldier lay in the deep sleep of the recently healed. Automatically Hanani pushed aside the bandages to check his belly. The flesh was whole and scarless, though still smeared with the blood and gore that had been spilled prior to healing. “My petitioner is fine,” she said, looking up at Yehamwy in confusion. Less disoriented now, Hanani looked around the Hall of Blessings and frowned. When she’d begun work on the soldier, the Hall had been full, humming with the voices of those come to offer their monthly tithes, or petition for the Hetawa’s aid, or just sit on pallets amid the moontear blossoms and pray. The sun still slanted through the long prism windows, but now the Hall was empty of all save those on the dais with Hanani, and a cluster of Sharers and Sentinels near one of the tithing alcoves. The same place she’d seen something, in the realm between. That was strange. And it was far too early for the Hall’s public hours to have ended. “Hanani had nothing to do with this,” Mni-inh said. Hanani looked up in surprise at the sharp tone of her mentor’s voice. He was glaring at Teacher Yehamwy. Hanani caught her breath and looked at Mni-inh, who nodded in sober confirmation. “But…” She groped for words. Her ears rang, as if the words had been too loud, though no one would shout in Hananja’s own hall, at the feet of Her statue. Hananja treasured peace. “H-how? It was a simple procedure. Dayu had done it before, many times; he knew what he was doing even if he was just a child…” A Moon-wild, joyful jester of a child, as exasperating as he was charming. She could not imagine him dead. As well imagine the Sun failing to shine. “But Dayu — ” Her throat closed after the name. Dead. Her vision blurred; she pressed her hand to her mouth as if that would push the horror from her mind. Dead. “Until then,” Yehamwy said, “on my authority as a member of the Council of Paths, Sharer-Apprentice Hanani is prohibited from further practice of any healing art or narcomancy, pending the results of the examination.” He turned to one of the black-clad Sentinels who stood guard at the door leading into the inner Hetawa; the Sentinel turned to regard them. “Please note this for your brethren, Sentinel Mekhi.” The Sentinel, his face duty-blank, nodded once in response. Dayu was dead. Hanani stared at Yehamwy, unable to think. Dayu was dead, and the world had bent into a new, unrecognizable shape. Hanani should have bowed over her hands to show her humility and acceptance of the Councilor’s decree, and she knew that her failure to do so reflected badly on Mni-inh. But she kept staring at him, frozen, even as his scowl deepened. “It is the Sharers’ duty to discipline our own,” Mni-inh said. He spoke very softly, but Hanani could hear the suppressed fury in her mentor’s voice. “Then do your duty,” Yehamwy snapped. Throwing a last cold look at Hanani, he turned and walked away. Hanani looked up at her mentor, who stood glaring after the councilor as if contemplating something most unpeaceful. Then his anger faded as he looked down at her. She read compassion in his eyes, but resignation as well. “I’m sorry,” he said. “Your work with the petitioner was flawless. I can’t imagine our pathbrothers will discard your trial because of this, but…” His expression grew grim. He knew the Hetawa’s politics better than Hanani. The promise of a Gatherer’s comfort was tempting, but then bitterness eclipsed that desire. She had lost her dearest friend in the Hetawa, and her hopes for the future seemed likely to follow him. She did not want comfort. I want everything back the way it was. Mni-inh hesitated, just for an instant, before responding. That was when Hanani realized: something was wrong with Dayuhotem’s body. If Mni-inh did not want her to see the body, then Dayu had not died at peace. A soul that died in pain or fear or anger was drawn into the shadowlands, the dark recesses of Ina-Karekh, there to suffer for the rest of its existence amid endless nightmares. It was the fate dreaded by all who honored the Goddess Hananja. Trembling, Hanani groped her way to a nearby bench and sat down, hard. She needed to curl up in the Water Garden to weep for a day and a night. Mni-inh read her face. “Hanani,” he began, but then faltered to bleak silence himself. Sharers were trained to offer comfort after a tragedy, but they were not Gatherers; their comfort was only words, ineffective as those were. Hanani had never felt the inadequacy of that training so powerfully as now. And what if Teacher Yehamwy was right? whispered a little voice in the back of Hanani’s mind. What if Dayu’s death and damnation were somehow Hanani’s fault? The statue of Hananja, forty feet high and gleaming in white-flecked nightstone, loomed overhead. Would it help to pray? she wondered, distantly. Dayu and the dead tithebearer would need prayers where they had gone. But no words came to her mind, and after a long empty moment she stood up. “I shall be in my cell,” she said to Mni-inh. And though she saw Mni-inh raise a hand as she turned away, his mouth opening as if to forestall her, in the end he said nothing. Hanani went away alone.